Government scientists have concluded that a nerve agent used to poison double agent Sergei Skripal came from Russia, British media reported. The mounting evidence could be a prelude to the British Government formally accusing Russia of mounting an assassination attempt on its soil. Skripal and his daughter Yulia were poisoned on March 4, and remain in critical condition. British government scientists have reportedly concluded "beyond reasonable doubt" that the nerve agent used to poison ex-Russian spy Sergei Skripal and his daughter Yulia last week was made in Russia. Specialists at Porton Down, the Ministry of Defence's chemical warfare lab, reached the conclusion last night, according to The Daily Telegraph newspaper. Tests carried out on Sunday proved "beyond reasonable doubt" that Russia made the chemical used in the attempted murder on March 4. The compound's identity has yet to be made public. Senior government sources also told The Times newspaper that police and security officials have established "sufficient evidence" to link Russia to the attack. The Ministry of Defence and Metropolitan Police declined to comment on the reports when contacted by Business Insider. The Skripals collapsed in a shopping centre in Salisbury just over a week ago after being exposed to nerve agent. They were taken to hospital and have been in critical condition ever since. The elder Skripal was convicted of passing Russian state secrets to British intelligence between 1995 and 2004, before being pardoned and sent to Britain in a spy exchange in 2010. The gathering of scientific evidence about the attack could be a prelude to the British Government formally accusing Russia of trying to kill Skripal on its territory. According to The Times, The Telegraph, and Sky News, Prime Minister Theresa May could take that step as soon as Monday. She could also call for new sanctions against Russian nationals close to President Vladimir Putin, the expulsion of Russian diplomats from the UK, and the withdrawal all official representation at the World Cup in Russia this summer, The Times said. The announcement is expected to come after a National Security Council meeting on Monday, where May will take evidence from the UK's three intelligence agencies MI5, MI6, and GCHQ. Tom Tugendhat, the chairman of the House of Commons Foreign Affairs Committee, also told BBC Radio 4's "Today" programme that the attack looks like it was state-sponsored. British counterterror police are leading the investigation into the attack. They are being supported by 180 military personnel, who helped remove contaminated items from the shopping centre where the father and daughter were found. 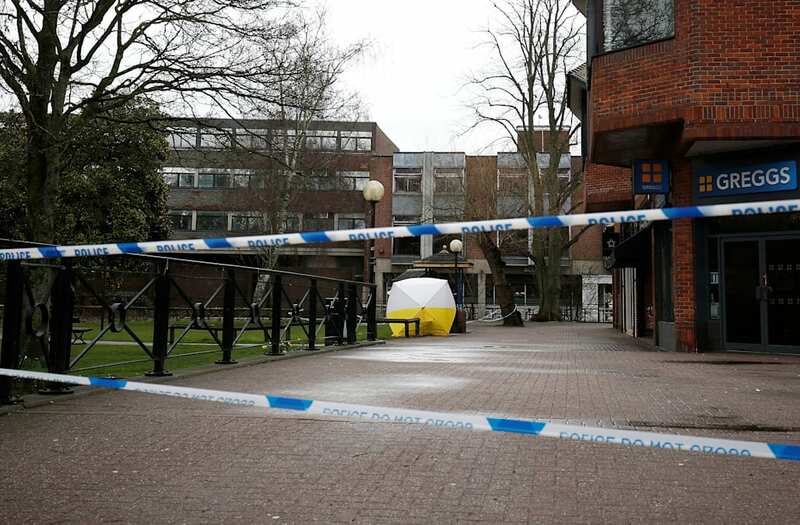 Police also found traces of the nerve agent at a restaurant and a pub in the shopping centre, and have asked the roughly 500 people who might have been in the vicinity to wash their clothes and other belongings in case they were affected. A police officer, Sergeant Nick Bailey, was also seriously injured after responding to the Skripals. He is now "talking and engaging," UK Home Secretary Amber Rudd said. The Kremlin has vehemently denied any involvement in the attack.